Cool Water Cologne by Davidoff, Davidoff launched the legendary fragrance Davidoff Cool Water for men in 1988. This scent revolutionized men’s fragrances thanks to the air of freshness injected into the mixture. This sharp and intense cologne manages to combine a crispness that resonates with men from all walks of life. Men around the world reach for Cool Water. Davidoff and perfumer Pierre Bourdon are the masterminds behind the enticing scents of this masterwork. A full-bodied fragrance is comprised of top notes, middle notes, and base notes. These elements mix to delight the olfactory system with a bountiful array of scents. Top notes are the first fragrances to hit the senses after spritzing. Cool Water by Davidoff combines coriander, green nuances, lavender, mint, and rosemary for a winning combination of top notes. The middle notes include geranium, jasmine, neroli, and sandalwood. For lasting power, the base notes of Davidoff Cool Water cologne include amber, cedar, musk, and tobacco. Davidoff Cool Water for men is one of the brightest options for men’s fragrances. There’s nothing like the innate masculinity of the Davidoff Cool Water perfume. The striking simplicity and sharp freshness of it is startling in its power. After splashing the refreshment onto the skin, the invigorating fragrance will carry through with its perfect balance of crispness and rugged machismo. 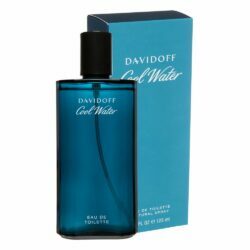 When looking at perfumes, there are several reasons why one would choose Davidoff Cool Water: For men, this is the ideal choice for day and summer wear, as its bright scent is perfect for when the skies are are the same hue as the blue bottle. It’s a simple aroma that can serve virtually any occasion, from a formal night out to a professional itinerary, however. Perfumeuae.com is the top place to shop online for high-end fragrances. We offer free shipping and a satisfaction guarantee to enable customers to buy with confidence. We promise that every product we offer for sale is authentic: We will never sell any fake products. We are a trusted provider of top colognes such as Cool Water. Davidoff scents are just some of the legendary products we have in stock, so feel free to browse to find the perfect gift or item for yourself!